The tentacles of the fake stamp and stamp paper scam, better known as the Telgi scam who has penetrated 12 states and is estimated at a whopping Rs 20,000 crore plus. He is a convicted-counterfeiter from India. He earned money by printing counterfeit stamp paper in India. Between 1992 and 2002, 12 cases were registered against Telgi relating to counterfeit stamps in Maharashtra alone and 15 cases in other parts of the country. Telgi eventually moved to more complex and expansive counterfeiting when he began to counterfeit stamp paper. He began printing fake stamp paper. He appointed 300 people as agents who sold the fakes to bulk purchasers, including banks, insurance companies, and share-broking firms. The size of the scam was estimated to be more than 20,000 crore (US$4.46 billion). One aspect of the scandal that caused much concern was that it required the involvement of many police officers and other government employees. For example, one Assistant Police Investigator was found to have a net worth of over 100 crore (US$22.3 million) despite making a salary of only 9,000 (US$200.7) per month. On 17 January 2006, Telgi and several associates were sentenced to ten years' rigorous imprisonment. 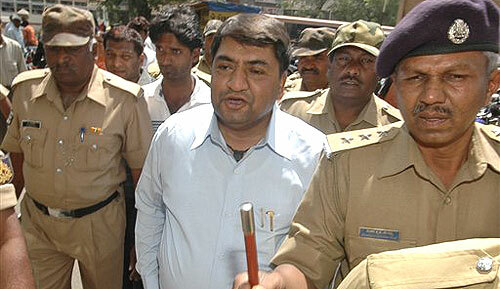 On 28 June, 2007 Telgi was sentenced to rigorous imprisonment for 13 years for another aspect of the scandal. He was also fined a Rs 100 crore. The CBI requested that Telgi's property be confiscated to pay the fine. The Telgi scam is by no means a case of police corruption and political connivance helping an ingenious crook to set up a fast-growing dubious business.